This stunning Cruze concealed shower package provides you with everything you need to give your enclosure/wet room a stylish designer makeover. Features a minimalist concealed thermostatic shower valve with round handles. Offers thermostatic showering via two easy-to-operate controls. Separate controls for temperature and flow. Operates two shower accessories separately or simultaneously. The stainless steel large ultra thin round ceiling mounted rainfall shower head and shower handset feature rub clean nozzles and provide a invigorating showering experience. 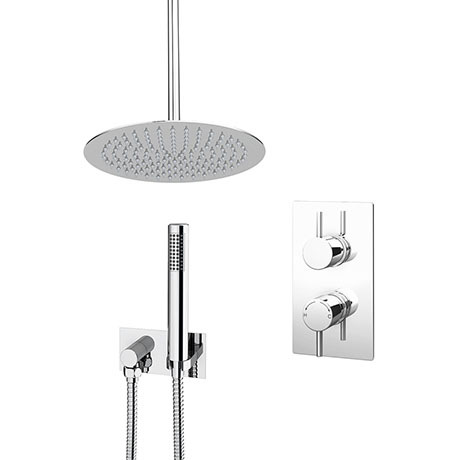 Add the perfect finishing touch to your bathroom with this stylish Cruze councealed shower package. Gives a contemporary professional finish to designer showering areas.